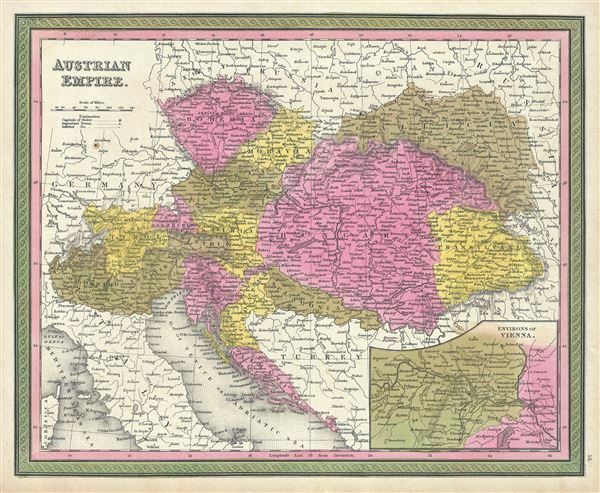 This is a fine example of Thomas Cowperthwait and S. A. Mitchell's 1846 map of the Austrian Empire. Covers the territories claimed by the once vast Austro-Hungarian Empire, including in whole or part the modern day nations of Austria, Hungary, Germany, Italy, Albania, Croatia, Romania, and the Czech Republic. An inset in the lower right quadrant details the environs of Vienna. The whole is engraved in Mitchell's distinctive style with green border work and vivid pastels. Political and topographical features are noted and color coded with elevation rendered by hachure. The Austrian Empire, founded in 1804 by the last Holy Roman Emperor, Francis II, lasted only till 1866. It was transformed into the Austro-Hungarian Empire after Austria was defeated in the Austro-Prussian War of 1866. This map was prepared by S. A. Mitchell for publication in the 1846 edition of Mitchell's New General Atlas. Rumsey 0537.057. Phillips (Atlases) 814.